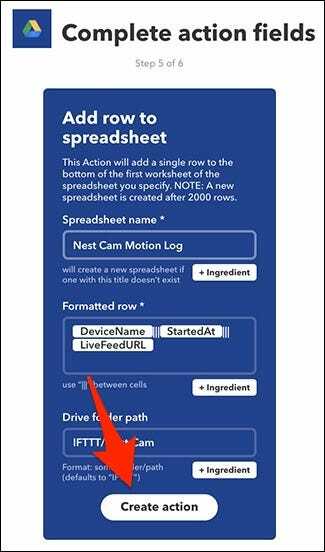 If you want to keep a permanent log of every motion event that your Nest Cam captures, you can do so using IFTTT and a Google Doc spreadsheet. Here’s how to set it up. If you have a subscription to Nest Aware, your Nest Cam can record video 24/7 and alert you of any motion. Without it, your Nest Cam can still send you motion alerts, but it will only record snapshots of the motion and will only keep that info for up to three hours, which sometimes isn’t enough time for users to thoroughly review. And once that three hours is up, you won’t have any record of when your Nest Cam detected any motion. 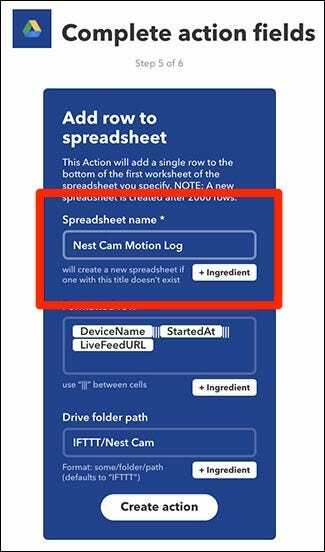 However, using IFTTT, you can create a log that lists the times your Nest Cam detected motion. It won’t save videos or snapshots, but it will at least show you when someone tripped your Nest Cam’s motion detection. Plus, this information won’t expire at all and you can keep it for as long as you’d like, whether you pay for Nest Aware or not. If you haven’t used IFTTT before, check out our guide to getting started for info on how to create an account and connect apps and services. Then, come back here to create the necessary applet. Start by heading to IFTTT’s home page and click “My Applets” at the top of the page. Type in “Nest Cam” in the search box or scroll down and find it in the list of products and services below that. Click on it when you locate it. 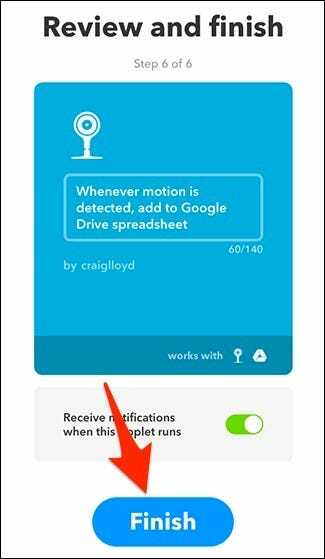 Connect your Nest Cam to IFTTT, if it isn’t already. After that, select “New motion event” as the trigger. You can also choose “New sound or motion event” to include when sound is detected as well. Select which Nest Cam you want to apply this applet to. If you only have one Nest Cam, it will be selected by default. Hit “Create trigger”. Type in “Google Drive” in the search box or scroll down and find it in the list of products and services below that. Click on it when you locate it. Click on “Add row to spreadsheet”. On the next screen, start off by giving the spreadsheet a name. Below that, format how you want the spreadsheet laid out. By default, it will list the Nest Cam that detected the motion, what time the motion started, and will put in a link to the live view of your Nest Cam. 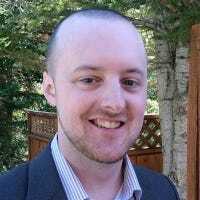 However, you can format it any way you want, but you only have those three fields that you can insert in the spreadsheet. Next, under “Drive folder path”, choose where you want the spreadsheet saved with your Google Drive. 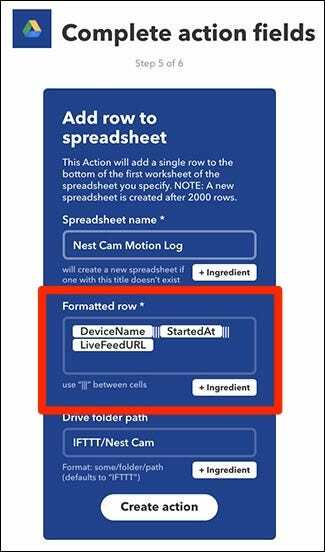 By default, it will create a “Nest Cam” folder within an “IFTTT” folder, but you can customize it. Leave it blank if you just want the spreadsheet placed in your main Google Drive directory. Once you have that all done, click on “Create Action”. On the next screen, review your applet and give it a custom name if you wish. Then click “Finish” at the bottom. Give your Nest Cam some time to detect motion, and once it does, you should see your new spreadsheet appear in Google Drive within an “IFTTT” folder. Open it up and you’ll see timestamps of when your Nest Cam detected motion, as well as links to the Nest website that will take you to a live view of your Nest Cam. Again, this doesn’t save video clips or snapshots of the actual motion that was detected, but it can at least give you an idea of when someone walked through the camera’s field of view, and can be used to confirm events, like whether or not your teenager actually came home last night when they said they did.